The Advance SC8000 rider scrubber pioneers enhanced design. It has the largest cylindrical scrub deck in its category. It sweeps and scrubs all at once with dual counter-rotating brushes. The optional DustGuard™ sprays a light amount of water, creating a “fog” at the side brooms, repressing dust. For ease of use, the One-Touch™ button activates the whole scrub system. 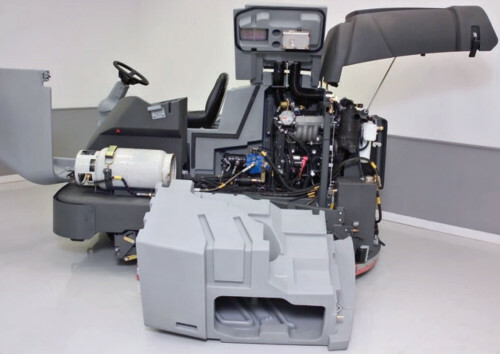 Four customizable settings provide the ability to modify the scrubber to every task. The scrubber has a cleaning path of up to 62 inches. Between that and the 100-gallon solution tank, it can clean up to 100,000 square feet per tankful with typical scrubbing speeds. The optional EcoFlex™ System gives the user the ability to adjust pad pressure, detergent use, and flow rate. The machine can clean with no water to maintain floors and all the way to standard detergent, for grease and more heavily soiled areas. The machine’s reliability is backed by a Kubota engine that does not require chains or timing belts. The SC8000 sets the standard by being extremely productive, safe, and easy to use.